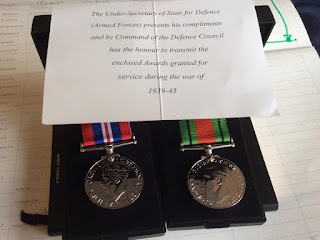 WW2 - The Second World War: Medals for Mary ... after more than 70 years! In February 2018, ATS Lance Corporal Mary Hanson finally received her WW2 service medals and written thanks for her service - more than 70 years after the end of the war. Between 1942 and 1946 Mary served in the A.T.S. (Auxiliary Territorial Service), the women's branch of the British Army. A few weeks later, and in time for the 2018 Armed Forces Day and Mary's 97th birthday, she also received her M.O.D. Veterans Badge. Appropriate recognition for Mary's fine contribution to the war effort during WW2. To read more about Mary's story click on 'Comments' below. Born in Batley, Yorkshire on 2 July 1921 Mary Hanson enrolled into the A.T.S. 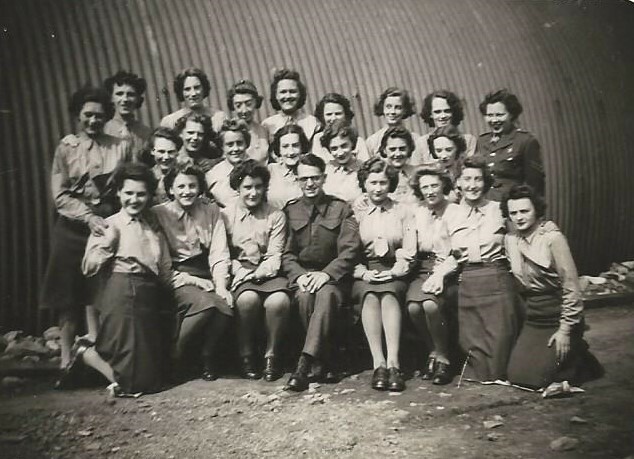 (the women's branch of the British Army) between 1942 and 1946. Although Mary was awarded the 1939 – 1945 War Medal and the Defence Medal in the years after the war she never applied for them and they were never issued. At the age of 96 and with the assistance of her nephew John Holland, Mary applied for her wartime service record and her medal entitlement. Thus, in February 2018 Mary finally received her wartime medals. Photograph No 1 (above) shows Mary in her wartime uniform (left) and in 2018 after receiving her medals (right). Along with the medals was a written letter of thanks from the Under-Secretary of State for Defence [Photograph No. 2]. 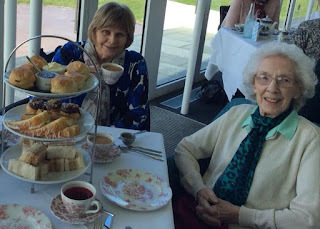 Shortly afterwards, Mary celebrated with her nephew John and his wife Mary with an afternoon tea at the Midland Hotel, Morecambe [Photograph No. 3]. While at St Mary's R.C. school in Batley Mary was the "May Queen" one year (1932/33) [Photograph No. 4, left]. A short time later Mary's family moved to live at Bradford, also in Yorkshire because her younger sister Kathleen had been granted a scholarship to Bradford Grammar School. Hence, when Mary left school she worked as a window dresser at Novello's department and fashion store. In 1939 Mary took part in a fashion show at Novello's [Photograph No. 4, right]. Most of Mary's wartime service was spent at Overton-on-Dee on the Welsh-English border [Photograph No. 5]. Photograph No. 6 shows Mary with her wartime Army colleagues at Overton. Mary now lives in Chorley, Lancashire close to her nephew John Holland, who has written the main part of Mary's story below. "Mary Hanson was Born in Batley, Yorkshire on 2nd July 1921, the eldest of 4 children. The family moved to 280 Otley Road, Bradford, Yorkshire in the mid 1930’s. On the outbreak of WW2 Mary, now 18, was working as a window dresser at Novello’s Department Store, Bradford. She wanted to ‘join up’ and enlist in the WRNS (Navy) as she thought the uniform was much nicer. Her mother however, wouldn’t give Mary her birth certificate. By December 1941 the National Services Act (No 2) made conscription of woman a legal requirement. Single women 20-30 years were called up first. So, Mary’s mother had no choice but to let her go when called up. But it wasn’t to the Navy as Mary had hoped, but to the ATS (Auxiliary Territorial Service). She enlisted on the 15th May 1942 and started her training as a Private in the ATS/TC, stationed at Bingley and attending the Technical College in Leeds. 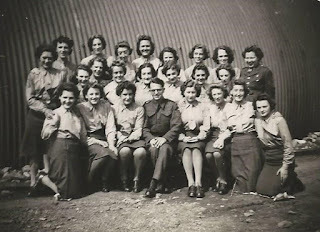 Like many other young women, often away home for the first time, they took it all in their stride, followed orders and went where they were sent. After passing her RAOC Trade Test 111, was posted to S Coy (Company) to Ruabon, North Wales on 1st November 1942 as a Clerk. Within two weeks she was posted to S Coy at Overton -on-Dee and on passing TT 11, she qualified for an appointment as Clerk, RAOC Group Class11. By February 1943 Mary had passed her TT1 and was promoted to Lance Corporal. Being moved around to different Companies was expected and Mary was in A, S, F, and L Coy’s throughout her service, to fill vacancies as needed. During August 1945 Mary was posted from Overton-on-Dee to Chester and then in November the same year, to Mersey Sub District. Mary was released from ATS on 4th May 1946. Relegated to U/List, finally being discharged 1st April 1954, her services 'no longer being required'." "Mary has fond memories from her wartime experiences and it gave her a new-found freedom and independence. 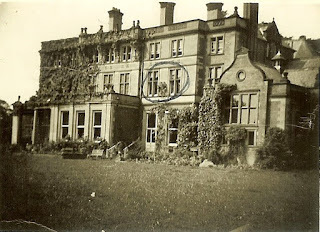 At Overton-on-Dee she was stationed with other young women at Bryn-y-Pys-Hall [Photograph No. 5]. It was a big house which could be a bit scary sometimes at night. She recalled once going home on leave, missing her bus to the train station and a lorry stopping to ask if she wanted a lift. She jumped in without a care and on asking if she liked chocolate, said yes, the driver then saying help yourself behind you. It was a wagon full of Cadbury’s chocolate. She took two bars and duly ate them, not saving any to take home. Mary also used to love dancing and has very fond memories of some of the American Soldiers who occasionally attended local events. Mary didn’t like the style of cap with “duck’s beak”, as she called it, in her day to day work uniform which they had to wear, so decided to unpick the stitching and sewed it back on the other way as photo 1 (left) shows. It was so admired by some of the other girls who ask her to change theirs as well. All the girls had a “best” uniform for going out and other occasions, which had a different style of hat. Mary said that no officer ever commented on what they had done. The women’s officers were stricter than the men when on parade inspection. Hair had not to touch the back of their collar, but many angles of the head and neck were used to disguise the actual hair length. Mary, and some of the other girls, occasionally used tape to hold their hair up in curls to keep it off the collar. At Chester, she was stationed in a big house overlooking the racecourse, sometimes going over to a nearby Salvation Army shop for lunch which sold fish and chips. One of Mary’s jobs was to order supplies, during her time at Overton-on-Dee, Mary gained the nick name “Hammer” following a bit of a mix up with the quantity of hammers she ordered, a nickname her army friends continued to use after the war ended. Mary was glad, like everyone else when the war ended, and it was a matter of getting on with things as she returned to civilian life. Mary remained lifelong friends with Joan from Hull and Gwen who went on to marry John, who lived near Ormskirk, Lancashire. She has lived an interesting and varied life, working in a variety jobs, including British Road Services (now Exel plc), ERNIE and a short spell as a Housekeeper to Benedictine Monks, putting her Army skills to good use. Mary enjoyed traveling home and abroad, during which she developed a love for the English Lake District, as well as classical music. She still watches the “Proms” on the TV but prefers the conductors to be male. Mary never married and now lives near her nephew John and his family in Chorley, Lancashire. With help in January 2018, Mary successfully applied for her service records and the two WW2 medals award to her which like many others, she never applied for. Sad that there was such loss of life, with many new friends being made and lost, but happy that her younger brother Jack returned to the family home after his active service." Thanks to Mary, here nephew John and John's wife, also called Mary, for contributing Mary's wartime story and the photographs used for this article. Wear your medals with pride, Mary. They were well earned. In June 2018 Mary finally received her Armed Forces Veterans Badge from the Ministry of Defence, just in time for Armed Forces Day and Mary's 97th birthday [Photograph No. 7 above]. Thank you, Mary. We salute you!